The Los Angeles Opera’s presentation of Philip Glass’s Satyagraha now onstage through November 11 has a momentous feeling about it. Phelim McDermott and Julian Crouch’s 2007 landmark production of this previously ignored late 20th-Century masterpiece may have single-handedly ushered in a much broader and very well-deserved late-career renaissance for Mr. Glass. The work has always been there and has always been worth hearing and talking about, but over the course of the last decade since this production’s premiere, Glass’ music seems vital and edgy all over again. And in a way, this production blesses just about everything it touches, and Los Angeles Opera has benefited from it too. 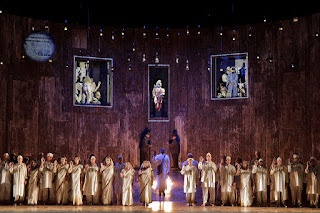 Satyagraha caps the company's presentation of Glass’ triumvirate of early "great-thinker" operas which also includes Einstein on the Beach seen in Los Angeles on its recent world tour revival in 2013 and Akhnaten subsequently in 2016 a production also from English National Opera directed by Mr. McDermott. That an American company of this size would mount all three of these in under a decade is largely unthinkable. The fact that LAO did so is not only a testament to the quality of these productions, but it stands as the company’s most significant artistic achievement since the completion of Achim Freyer’s Ring cycle in 2010. Much was made of the financial repercussions of that endeavor, but it was a shining moment for the company – one that to this day is still under-recognized. 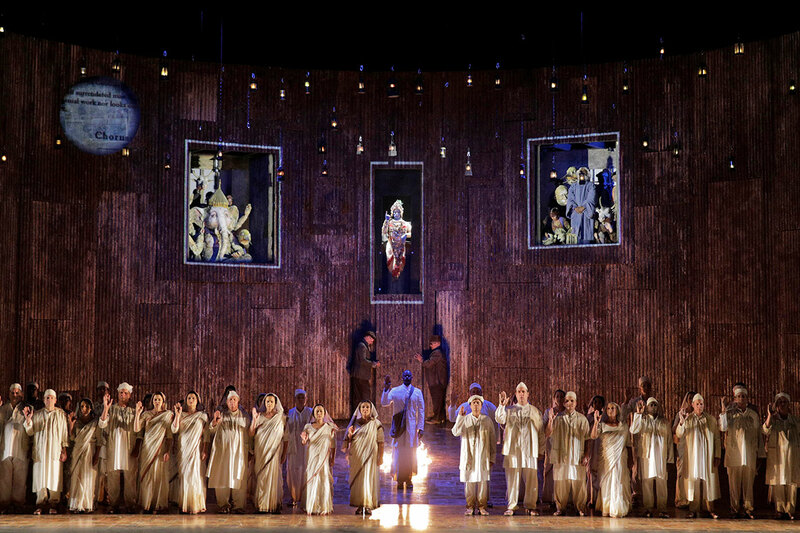 The staging of these Glass operas – while not in new productions mounted exclusively for LAO – is still undoubtedly another great landmark for the ensemble. That this moment is playing out under the baton of LA Opera Resident Conductor Grant Gershon is also no small matter. Gershon was an ideal choice for this assignment given his familiarity with late 20th Century and contemporary scores and his unparalleled expertise with choral conducting. Satyagraha has some of the most demanding and beautiful choral music written in the last 50 years and the Los Angeles Opera chorus shone brightly when I saw the performance on November 1. Another beneficiary of the many deserved accolades in this run is tenor Sean Panikkar who is excellent as Gandhi. Panikkar's star has been on the rise and he has had a banner year in 20th-Century repertoire he has made increasingly his speciality. In addition to this role, he starred as Dionysus in Henze's The Bassarids in his Salzburg festival debut this summer - a role as diametrically opposed to Gandhi as can be. He was superb in both, and LA audiences are lucky to see him. Soprano So Young Park has also made great impressions here in LA in prior outings and she is another standout in the Satyagraha cast as Miss Schlesen. I will admit that the production has grown on me over the years. The work is more ideological than narratively linear and McDermott and Crouch rely on a wide variety of acrobats, puppets, and clever ritualistic touches to imbue the show with a dizzying array of images that often unfold and wrap themselves around the viewer over the course of the evening. What I once felt was a somewhat literal take on the material strikes me now as more theatrical and tapping into the deeper ideological themes of the piece. You don't want to miss this.